In 1995 Sander started to work as an apprentice with another luthier. In 1996 he started his own company. During the first years he did mostly repairs, and a few custom guitars. It was a great learning period about guitars and the way they play and sound. Then Sander got interested in building acoustic guitars. The Transgression model was born, named so because it was a free and artistic approach to acoustic guitar making. It was an asymmetrical steelstring with the bridge in the center of the moving part of the top, much like a speaker. The sound was very rich but the need arose for a more traditional model called Progression. 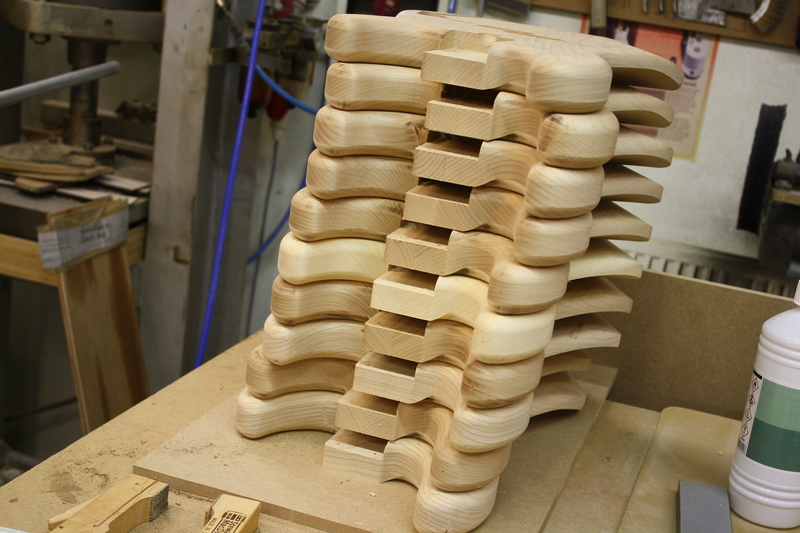 Sadly there was very little interest in these guitars, while orders for custom electrics kept coming in. Sander also realised that he liked to spray all kinds of colors, so the move from acoustics to electrics felt very natural. The first 2 models were a bass and a guitar. The bass was called Origin, because bass is at the foundation of music. It was a free design that fitted the times. Exotic woods, 24 frets, laminates, pickups with switching options, diverse preamp, etc. 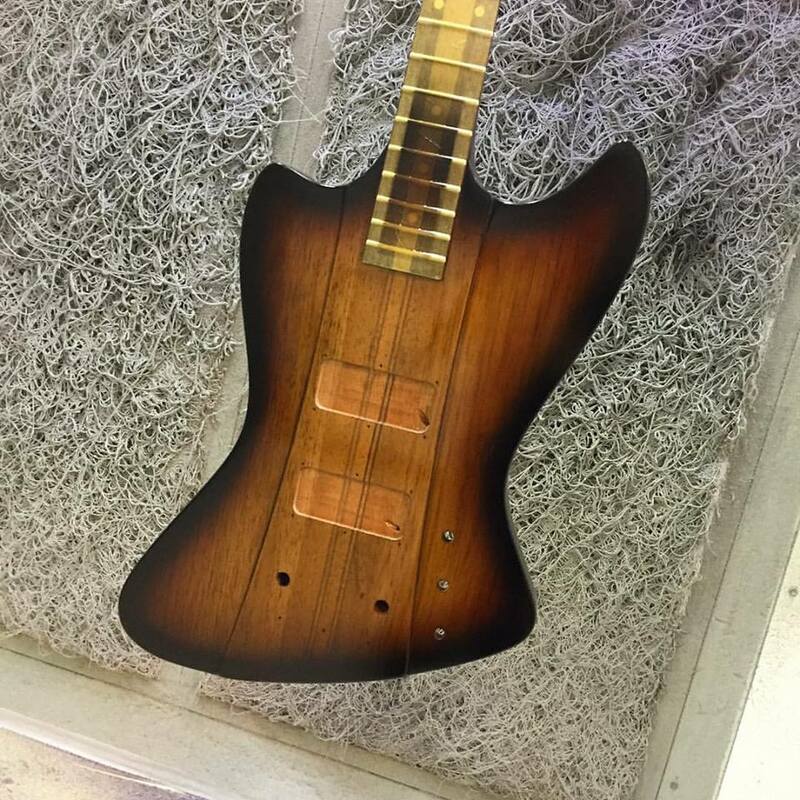 Later on it received the extension ‘deluxe’ when Sander designed a version with more traditional looks and a pickguard, the ‘custom’. The guitarmodel Sander had designed was called Reflection. It was a mix and match of all the things he liked from variuous other guitars. The body was Fenderish, the neck had a soft V shape, the headstock was angled with 3by3 tuners, the pickguard could contain all kinds of pickups, the bridge was a stoptail or a trem. It was a cool guitar, actually ahead of its time. By the time the model was discontinued it became popular to have a pawnshop guitar, a jagstang, a Fano, and so on, guitars that were all mix and matched designs. Sander had moved on with new designs. Another bass was introduced, the Elevation. Single cut basses were the new thing in the boutique scene. Elevation was styled after the Transgression model in outline. The same can be said of Authority, a single cut guitar. It was Sander’s take on a Les Paul, mixed with Transgression and some PRS influences. It had a handcarved top, it was still pre-cnc time. Often people remarked that they’d be interested in a budget version. That lead to the Junior, an undressed Authority basically. In the meantime the company had grown. Marianne, Sander’s wife, had become involved, and they had hired an employee. It was a coming and going of guitars for repairs, repaints, restaurations, and there were new orders for guitars and basses coming in continually. Then there was also a side-business that grew, the import of several brands of pedals, pickups and guitarparts, through their webshop pedalsandparts.com. All in all it had become pretty busy. With much hesitation Sander then started a new project, an interpretation of a jazzbass. Customers had been asking for this for years, but Sander had always refused, because he felt there were enough of them. It took at least 5 years before he realised that the issue at hand was about confidence, more then about technical specs. Origin and Elevation basses had brought Sander recognition as a high quality bassmaker, and people had the confidence that if he’d build a jazz it would be a great bass. It was a huge turn around for Sander, who had always taken his own creativity as a starting point and would now take tradition as a starting point. The BeBop model turned out to be beyond what he ever anticipated when Marcus Miller bought the prototype and the first order came from Richard Bona. Immediately people started asking: are you gonna do a P now too? So within a year Soulmate followed. 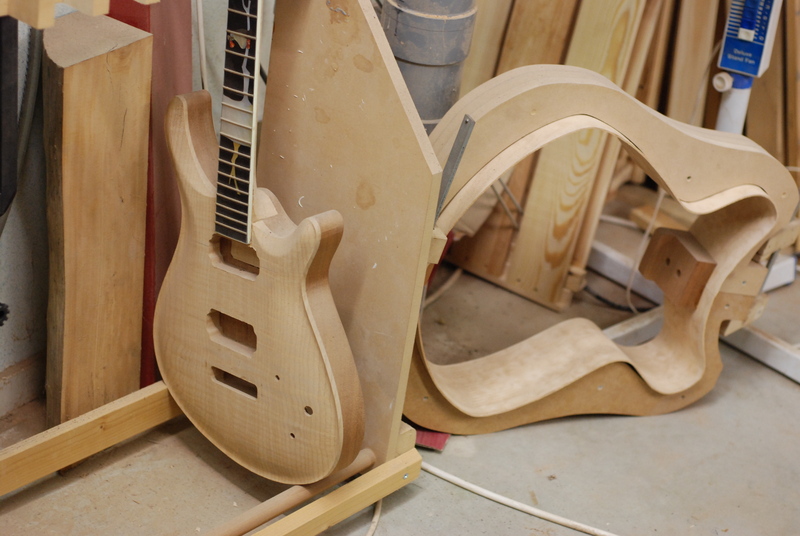 For several years Sander was busy building BeBop and Soulmate basses. It almost took over everything else. To stay in touch with his guitar customers he developed the Surfer, which is basically a Strat that stays in tune. Then his (now second) employee left the company. Sander decided to remain alone again, because it better fitted his personality. He then had to quit the repairs and customising because he no longer had time for it. 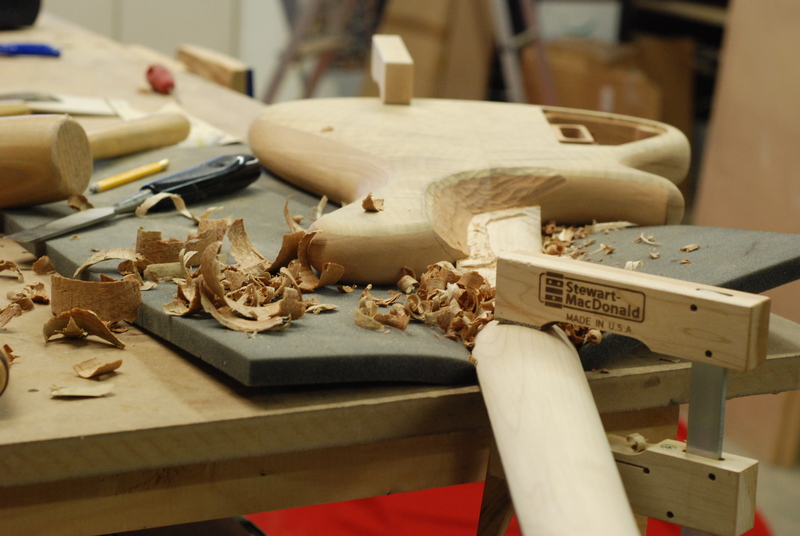 He reorganised his workplace to specialise even more in just building great instruments. Next came Lowlander. Sander felt comfortable in his new direction, that of re-interpreting classic designs, and wanted to build a T-bird without T-bird issues. It turned out to be an amazing bass, with enough improvements to call it a ‘better’ design, and enough classic influences to appeal to the original. And next? Who knows. Maybe a guitar version of Lowlander? Or a 5 string Lowlander? Or a new model? One idea on the shelf is a short scale hollowbody bass. Customers have asked for a 24 fret BeBop. We’ll see. If you’d like to see examples of all that Sander has built in over 20 years, check the galleries of the discontinued models.